The only Smallest Police Dash Cam System in the world you can use inside and outside the police car! The Worlds Only Police Car Camera System usable both Inside and Outside the vehicle. The Digital Partner 6 HD police Dash-cam incorporates a digital in car video system and a crime scene video camera all in one unit. Welcome to the Future of Police in Car Video Systems that fit in the palm of your hand. Finally a dual purpose camera system is available to departments on a budget. Now you're ready to with HD video code 10-8 on every shift! The Digital Partner records in 1080P HD. 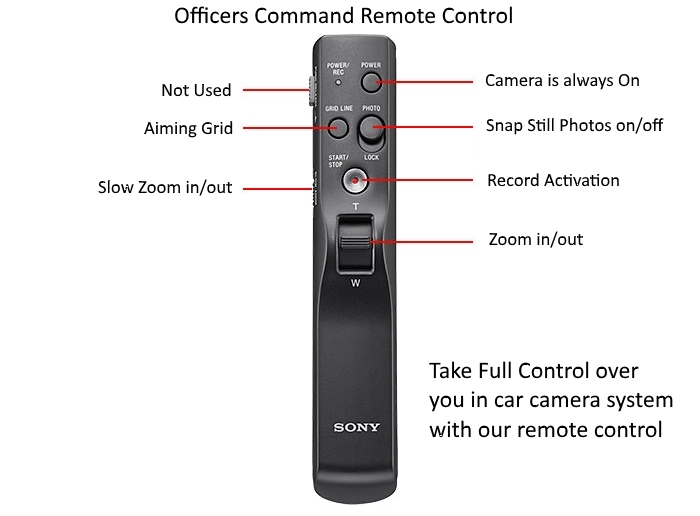 New for 2016 is an officers command console remote control joystick. It allows you to take full control over the camera system without touching it directly. Haven't you always wanted to video tape drugs inside the suspect's car, or have photograph for evidence of a domestic violence victim's bruises, simply using your police car video system. Record video directly on an SD Memory Card in the camera. Entire installation time: 2 minutes. No other in-car police video system on the market has these features, at this price. So many police agencies are getting video to watch and guard their police officers while they are in the field. Most are 4 protecting the officers. Video guard is a must in the video world of today. Police in-car watch video dash cameras are a great way to guard against problems that arise from bad video. Super HD video quality in a police dash cam! We loved our demo so much we bought 2 of the Police Dash Cam systems MDP6. The video excellent at night and the license plates and faces are super sharp. To share a different product, just select it from those shown below.